art three fans conventional wooden rings	signet ring	arm chair	steel bows	eyes butterfly eternal wave bridge DNA ring ellipse tetrahedron icosahedron two icosahedrons cube octahedron saddle wurm 90 struts cube trophy ball	more..
"There is no such thing as art - there are only artists." This is the first sentence in one of the most popular books on art "The story of Art," by prof. sir E. Gombrich. I like that statement, because I might think I'm an artist when I'm building a tensegrity, but I would hate it if one would say I'm making art. I try to work out an idea, a specific form that is in my head and in my head only, a construction, maybe something beautiful, but also maybe something looking very complex, but please no art! Probably, the most of us are not very interested in a discussion about what's art and what's not. This section of the website is called "art" just to focus on the artistic value of a tensegrity. So, in this section a little less words, no history, mathematics or biotensegrity, but a little more pictures instead. Tensegrities are three dimensional structures which are not always that easy to "catch" in a photo. In comparison to conventional sculptures tensegrities have the advantage that they are "airy" structures. You can look throught a tensegrity sculpture. But that is also the disadvantage: On a screen it is much harder to experience depth in a structure so the struts at "the far end" of the structure look very near the struts "at the front side" of the structure. 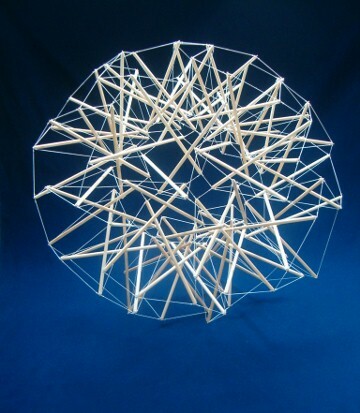 These two pictures of one and the same tensegrity give a good example. The pictures are taken from a different angle but it is still hard to figure out what the construction looks like. A normal statue is easier to appreciate than this "chaos" and it is hard to imagine there is a mathematical theory behind it. The real object looks a little bit more synoptic, but it still is a bundle of struts in chaotic order. Also during the construction it was hard to keep the struts and strings apart and there were times I had to keep myself together not to throw the clew in the trashbox. 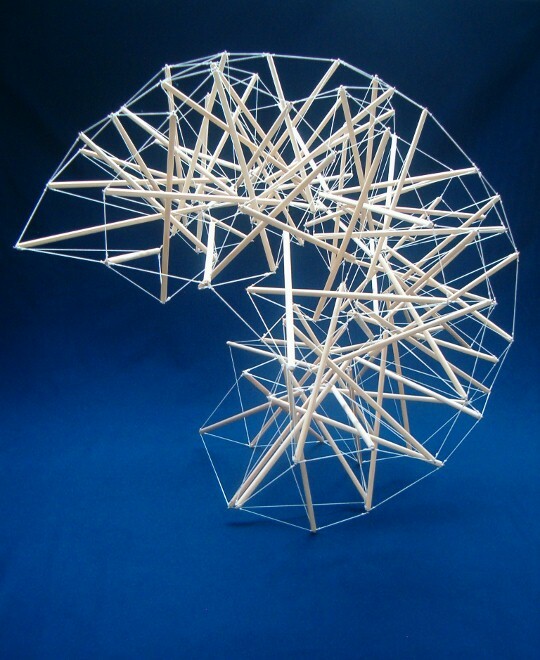 In short: you don't hear me say that this tensegrity is art, but I do say that it is an art to make it.